Arrive into Wellington and transfer to your hotel. 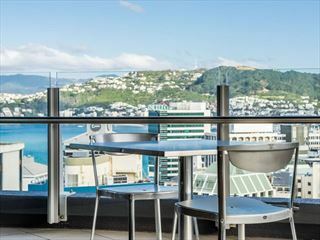 The rest of the day is at leisure – some of the main attractions nearby include the Botanic Gardens, Te Papa museum and the central shopping district. 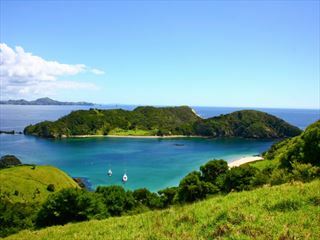 Take the Interislander Ferry and cruise for three hours along the Cook Strait and Queen Charlotte Sound to Picton. 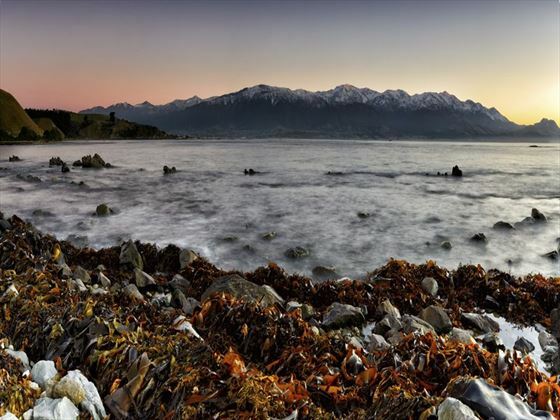 From here, you can tour the premier food and wine region of Marlborough, driving south to the small hamlet of Kaikoura. Staying right on the waterfront, you’ll have the beautiful view of the towering Kaikoura Mountains which overlook the town. Take a cruise this morning for two and a half hours from Kaikoura for a chance to see flocks of albatross up close. There are up to 12 species of albatross here, as well as penguins, skuas, shearwaters, petrels and gannets. Take some time to admire the views and relax as the waters lap the shore before walking along to a seal colony or taking a whale watching cruise. The wildlife here is what makes Kaikoura famous and seeing these creatures up close is a wonderful experience. Continuing down the highway and along the coast, you’ll reach the famous Canterbury Plains and the Akaunui Farm homestead. It is here that you’ll enjoy a delicious lunch with the owners, Di and Ian Mackenzie, followed by a tour of the building which is over 100 years old. In the afternoon, make your way through the rolling hillsides as the mountain scenery opens up ahead. On the edge of Lake Tekapo, the quaint church and famous statue of a sheep dog make great photo opportunities. Awake at the foot of Mt Cook and take an early morning stroll through the picturesque valleys. From here, you will make your way down the Mackenzie Basin and over the Lindis Pass – one of the highest roads in New Zealand – to Queenstown. Along the way, the natural beauty of the Kawerau Gorge will surround you and makes for great vistas. Ride the Skyline Gondola for an amazing overview of the resort then make the most of your hotel’s prime location, just moments from the town with views of Lake Wakatipu and the Remarkables Range. 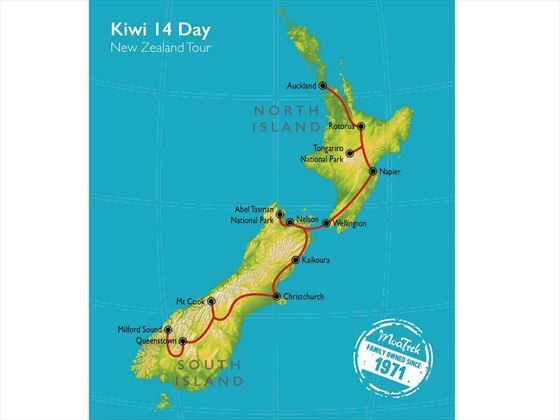 Travel alongside Lake Wakatipu to Te Anau and Milford Sound today, which is situated deep in the Fiordland National Park. The journey along the Milford Road is studded with mirrored lakes, glaciers, rugged mountains and waterfalls – the landscape in this region is remarkable. Upon arrival at Milford, you’ll take part in a boat tour with a nature guide who will showcase the beauty of this famous attraction which is dominated by Mitre Peak. As you approach the point where the Sound meets the Tasman Sea, you’ll find seal colonies lounging on the rocks. Return to Queenstown afterwards with a scenic flight over the Southern Alps for a great way to top of the day’s sightseeing excursions. 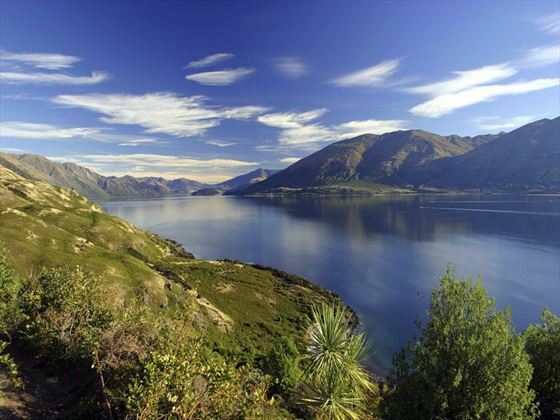 Spend the day at leisure today, making the most of your time in Queenstown. Your guide will be on hand to recommend a choice of activities, whether you want an active day or a relaxed experience. 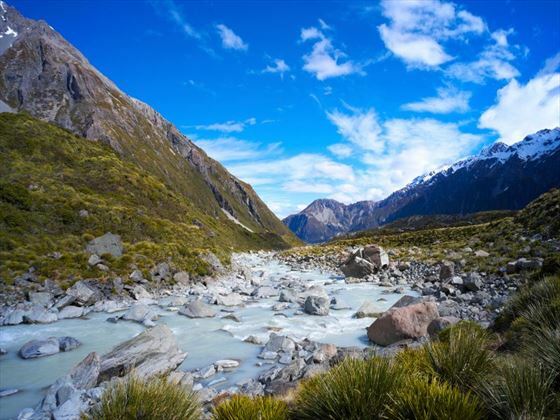 One activity that is highly recommended is an optional jet boat ride excursion on the remote Dart River, surrounded by the Lord of the Rings scenery. Alternatively, if you’re seeking a thrill-seeking adventure, go white water rafting down the Shotover River. Queenstown has numerous shops and boutiques, as well as the Botanic Gardens, if you want something more sedate for the day. Begin the day with a trip to Arrowtown, where the gold mining history is prevalent, then follow the road over the tussock country of the Crown Range which provides sensational views of the Gibbston Valley. 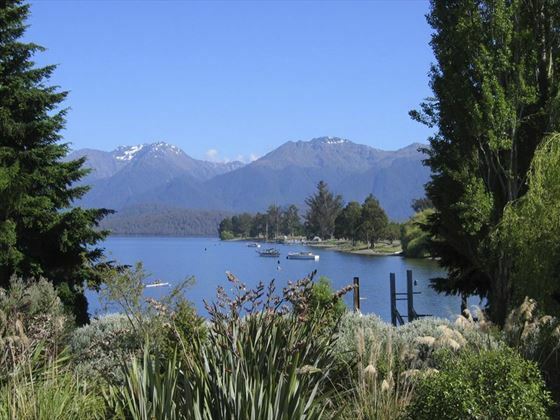 There will be a visit into the Cardrona Hotel which has a rich history dating back to the gold mining era, before heading to a Wanaka homestead for a private lunch. Afterwards, enjoy some free time to explore Wanaka at your own pace. 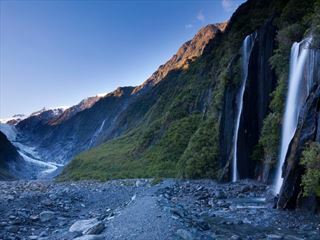 Drive along Lakes Hawea and Wanaka today and into the mountain scenery of the Haast Pass in Mt Aspiring National Park. The tracks through the native beech forests lead you to clear blue pools and waterfalls – this is a really picturesque part of the route. 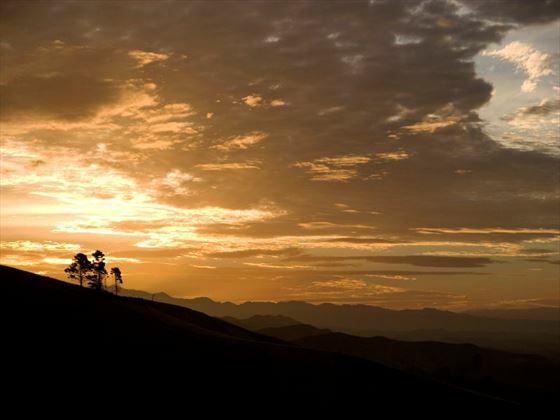 Head north through the Westland World Heritage Park, stopping en-route at Ship Creek to wander along the beach and through the swampland rainforest. 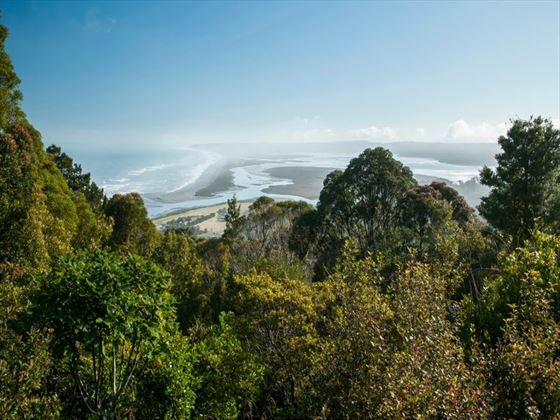 Drive to the coast to the charming settlement of Okarito, which is situated between the Okarito Lagoon and the Tasman Sea. 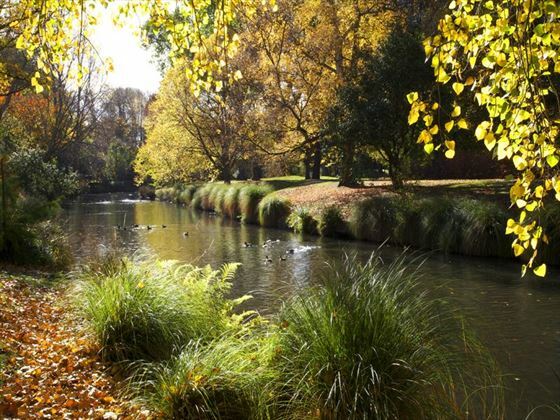 There’s the option to either take a gentle kayaking excursion or a cruise along the lagoon – this area serves as a feeding ground for the rare white heron which breeds in the nearby Waitangi Roto Nature Reserve. Travel north today as you venture through the Southern Alps to Hokitiki to visit the artisan craft galleries, such as glass blowing and Pounamu or greenstone carving. The coastal road follows part of the ancient trails used by Maoris, giving you the opportunity to see some of the unique coastal flora which grows here. Further along this road is the famous Punakaiki Pancake Rocks, which are sculpted limestone stacks. 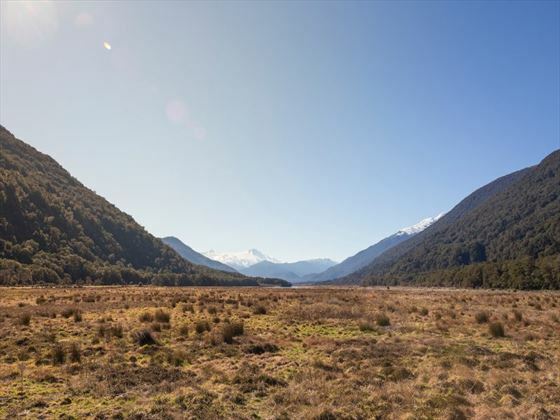 Today you will retrace your steps along the coast as you make your way up the Otira Gorge on a stunning cantilevered road through Arthur’s Pass National Park. Admire the views upon reaching the summit then stretch your legs in the beech forests of Arthur’s Pass village. Later on you will descend Porter’s Pass to the Canterbury Plains where you’ll continue on your journey to Christchurch, arriving in the late afternoon. This marks the end of your trip – after breakfast, make your way to the airport for your departing flight.